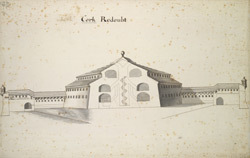 Plan of a large pentagonal casemated redoubt intended to be built in Cork, in the late 17th century. The casements were barracks rooms for the soldiers who manned the stronghold. ‘Redoubt’ is a military term used to describe a stronghold that stands in isolation and which would have been equipped to withstand a siege. The name 'Redoubt' probably comes from the French word redoubt, which means 'shelter'.